Welcome to a world on the edge. Launched by the novels of William Gibson, propelled by the visions of Bruce Sterling, Rudy Rucker, Neil Stephenson and others, Cyberpunk is the fusion of science fiction and "noir," a world in which the street finds its own uses for the gifts of science. In this gritty high-tech, low-life future, technology is merely another tool of power, likelier to corrupt its users than ennoble them. But those without technology have no chance at all. Is it a victory if you survive but lose your freedom . . . or your humanity? From ruthless corporations to half-mechanical back-alley killers, this book has it all. 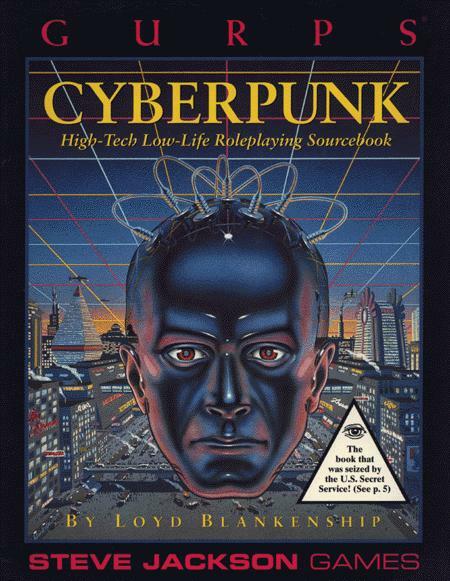 Also included are new advantages and disadvantages, netrunning rules, advice on tailoring a cyberpunk world to fit your own vision of the future, and dozens of deadly, miraculous gadgets that just might give your character the edge he needs to survive. This is the book that was seized by the Secret Service. GURPS Cyberworld – Your guide to the world of the One-and-Twenty, where the United States is under the totalitarian hold of the Provisional Government, the cities are floundering in their own decay and technology races faster and faster. GURPS Cyberpunk Adventures – This book presents three adventures that capture the dark essence of life in the streets of the all-too-near future. GURPS Cthulhupunk – The classic horror of the Cthulhu Mythos meets the dark future of cyberpunk . . .